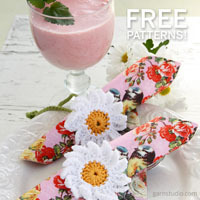 Go to original pattern for design DROPS 154-11. 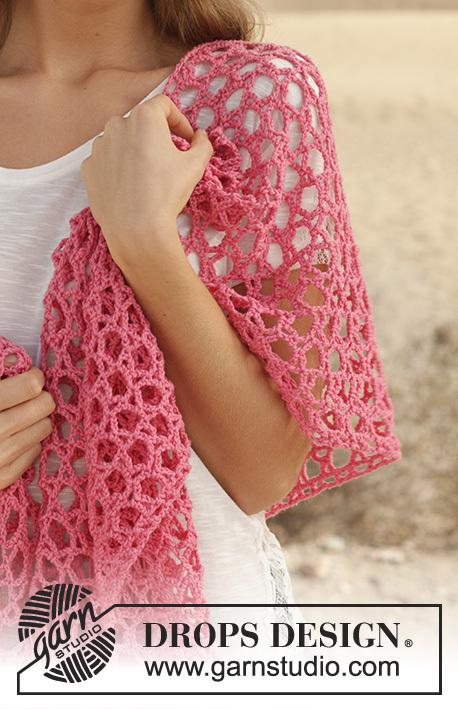 Crochet DROPS shawl with star pattern in "Cotton Merino". 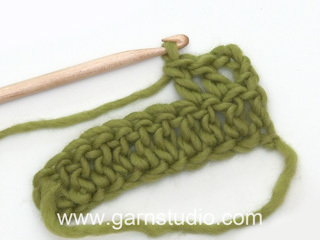 DROPS CROCHET HOOK SIZE 4.5 mm / US 7 – or size needed to get 2 repetitions of A.2 = width 11 cm / 4½''. 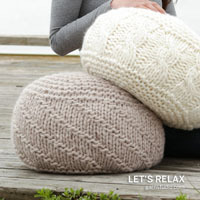 You can get the yarn to make this pattern from	25.80$. Read more. 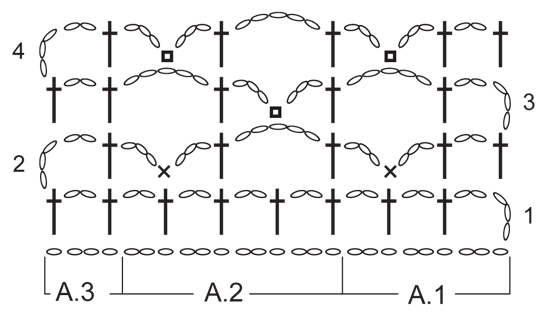 See diagrams A.1, A.2 and A.3. Work A.1, A.2 7 times in total, A.3. Repeat row 3 and 4 until piece measures approx. 168 cm / 66''. Work 102 ch with Cotton Merino on hook size 4.5 mm/US 7. ROW 1: 1 dc in 9th ch from hook, ch 2, skip ch 2, 1 dc in next ch, ch 2, skip ch 2, * 1 dc in next ch, ch 2, skip ch 2, 1 dc in next ch, ch 2, skip ch 2, 1 dc in next ch, ch 2, skip ch 2, 1 dc in next ch, ch 2, skip 2 ch *, repeat from *-* 6 more times, 1 dc in next ch, ch 2, skip ch 2, 1 dc in next ch = 32 dc. Turn. ROW 2: ch 5, 1 dc in next dc, * ch 3, 1 sc in next dc, ch 3, 1 dc in next dc, ch 5, skip 1 dc, 1 dc in next dc *, repeat from *-* 6 more times, ch 3, 1 sc in next dc, ch 3, 1 dc in next dc, ch 2, skip ch 2, 1 dc in next ch = 17 dc. Turn. ROW 3: ch 5, 1 dc in next dc, ch 5, * 1 dc in next dc, ch 3, 1 sc in ch-space, ch 3, 1 dc in next dc, 5 ch *, repeat from *-* 6 more times, 1 dc in next dc, ch 2, skip ch 2, 1 dc in next ch = 17 dc. Turn. ROW 4: ch 5, 1 dc in next dc, * ch 3, 1 sc in ch-space, ch 3, 1 dc in next dc, ch 5, 1 dc in next dc *, repeat from *-* 6 more times, ch 3, 1 sc in ch-space, ch 3, 1 dc in next dc, ch 2, skip ch 2, 1 dc in next ch = 17 dc. Repeat row 3 and 4 until piece measures approx. 168 cm / 66'' (adjust after row 4). Then work a finish as follows: ch 5, 1 dc in next dc, ch 2, 1 dc in first sc, ch 2, * 1 dc in next dc, ch 2, 1 dc in ch-space, ch 2, 1 dc in next dc, ch 2, 1 dc in next sc, 2 ch *, repeat from *-* 6 more times, 1 dc in next dc, ch 2, skip ch 2, 1 dc in next ch = 32 dc. Turn. Work 1 row with sc as follows: ch 1, 1 sc in every ch and dc = 96 sc. Fasten off. Work 1 row with sc along both short sides as follows: ch 1, 1 sc in every ch and dc = 96 sc. 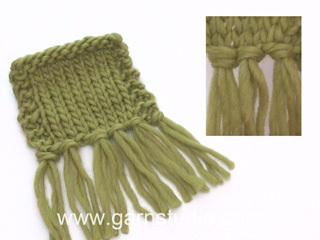 Fasten fringes in each square along short sides. 1 fringe: Cut 3 lengths of yarn of 20 cm / 8''. 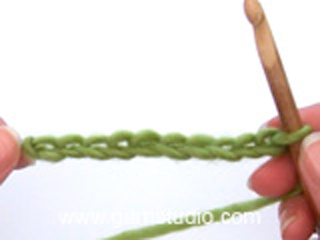 Fold them double and pull loop through a square. Then pull yarn ends through the loop. Place the piece in lukewarm water until it is soaking wet. Carefully squeeze out the water - do not twist. Then roll the piece in a towel and squeeze to remove more water - the piece will now only be moist. Place the piece on a carpet or mattress - carefully stretch it out to measurements found at the top of pattern. Leave to dry. Repeat the process when the garment has been washed. = 1 sc in ch-space. Row 1 and 2 are the start of the shawl. Row 3 and 4 are being repeated. See pattern for finishing. Dear Kathy, The shawl is worked starting from one end (short side) to the other end. When piece measures 168 cm (after a row 4), work a finishing row as stated under "FINISH" + 1 sc row then work 1 sc row on the other short side (along foundation chain). Happy crocheting! 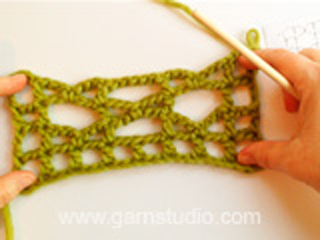 Dear Mrs Snoeren, the video below shows how to work diagram to this scarf. Happy crocheting! I have an "ICE Yarn" that is 10% Alpaca/ 25% Wool/ 65% Acrylic. The initial yarn strand is fairly thin with a fuzzy feel to it. Was wondering what your thoughts were trying to use this type of yarn for this project. Different hook size, etc? 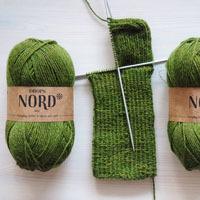 Dear Charlene, please click click here for all relevant informations about our yarn - please contact the store where you bought your yarn for any individual assistance. Happy crocheting! Een geweldige sjaal om te maken en te dragen. 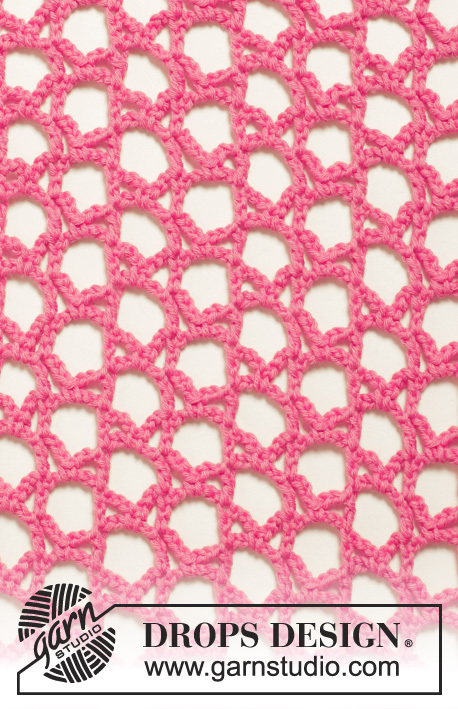 I haven't crocheted in such a long time but this shawl is gorgeous and I am tearing out the knitted one I just started so that I can attempt this one...wish me luck! Dear Laurie, you will need 300 g DROPS Cotton Merino for this shawl - measurements are given while working and after blocking (it will be then somewhat less width but longer). Happy crocheting! Print the pattern function doesn't work. Please HELP! Dear Mrs David, please first check that your browser allows pop'up windows, then click on "Print:pattern", a new window will open with an add, in this window, click on "Print the pattern" to launch printing. Happy crocheting! I was wondering what the multiples are in the foundation chain to make this shawl wider. Thank you. Dear Mrs O'Neill, to get 1 extra repeat, add 12 sts (1 time A.2), to get 2 extra repeats, add 24 sts (2 times A.2) and so on. Happy crocheting!